Contributing to the smorgasbord of old world architecture is a likeness of the infamous Roman Colosseum. Although games were a bit more violent in Ancient Rome, the Coliseum architectural elements that are worked into the Winstar’s façade tie a comparison to high stakes entertainment, as well as the decadent legacy of the Romans. 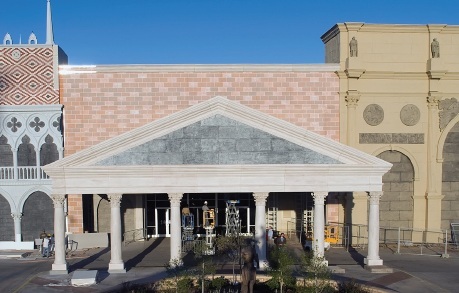 While it might not have the blood stained history of the Roman Coliseum, the Winstar’s replica is not to be missed. It was a tradition in the 19th century for high society folk to take “the grand tour,” which was basically a whirlwind trip through Europe to see the greatest historical sites. Now you don’t have to be a wealthy socialite to treat yourself to the spectacular sights of Europe. Instead, you can enjoy the many treats of the Continent right here in the USA. Other legendary elements at the Winstar World Casino include homage to the Doge’s Palace in Venice, and the Pantheon in Rome and even Napoleon’s L’Arc de Triumph from Paris! All of these elements are perfectly rendered in architectural fiberglass from Stromberg Architectural Products. GFRP is affordable, and it is versatile to emulate more expensive building materials like granite, marble or even rare metals. Architectural fiberglass is an extremely flexible building material, which can be used to construct complex fabrications. Thackerville, OK architectural fiberglass, architectural fiberglass in Reno, NV, architectural fiberglass in Las Vegas, NM architectural fiberglass in Detroit, MI, Rhode Island architectural fiberglass, New Orleans, LA architectural fiberglass, architectural fiberglass in Albuquerque, NM and more.